What is Accounts Receivable to Sales Ratio? The Accounts Receivable to Sales Ratio is a business liquidity ratio that measures how much of the company’s sales occur on credit. When a company has a larger percentage of its sales happening on a credit basisCredit SalesCredit sales refer to a sale in which the amount owed will be paid at a later date. Credit sales are purchases made by customers who do pay cash at the time of purhcase.There are three main types of sales transaction: cash sales, credit sales, and advance payment sales. The difference between these, it may run into short-term liquidity problems. Such a scenario may happen if a company is running low on cash due to a lack of cash sales in the business cycleBusiness CycleA business cycle is a cycle of fluctuations in the gross domestic product (GDP) around its long-term natural growth rate. It explains the expansion, peak, recession, depression, trough, recovery, expansion, and the entire business cycle keeps repeating in this loop. See examples and descriptions of the stages.. The Accounts Receivable to Sales Ratio is useful in evaluating how inclined a company is to conduct business on a credit basis. This can provide insight into its operational structure. A company that is able to run fine with little cash may have very small fixed costs or a low amount of debt in its capital structureCapital StructureCapital Structure refers to the amount of debt and/or equity employed by a firm to fund its operations and finance its assets. The structure is typically expressed as a debt-to-equity or debt-to-capital ratio. Debt and equity capital are used to fund a business’ operations, capital expenditures, acquisitions,. Having a very high AR to Sales ratio can be a negative indicator to debt providers, since high credit sales may compromise a company’s ability to make periodic interest payments. Furthermore, a very high ratio indicates that a company may not have much of a cash cushion to rely on during difficult economic times and slow sales cycles. 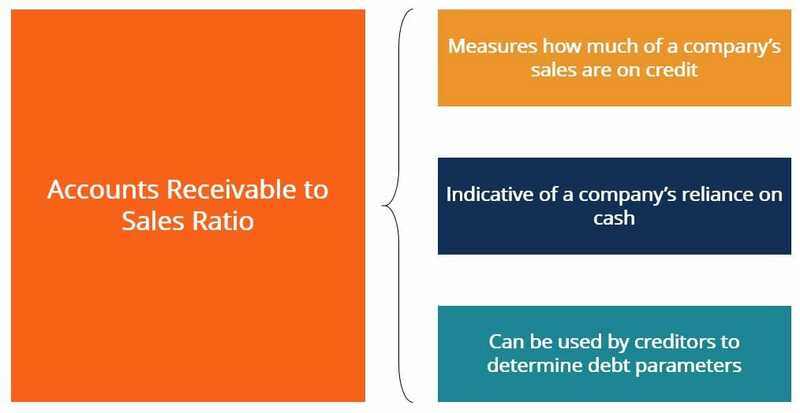 How can we calculate the Accounts Receivable to Sales Ratio? Accounts Receivable – refers to sales that have occurred on credit, meaning that the company has not yet collected the cash proceeds from these sales. 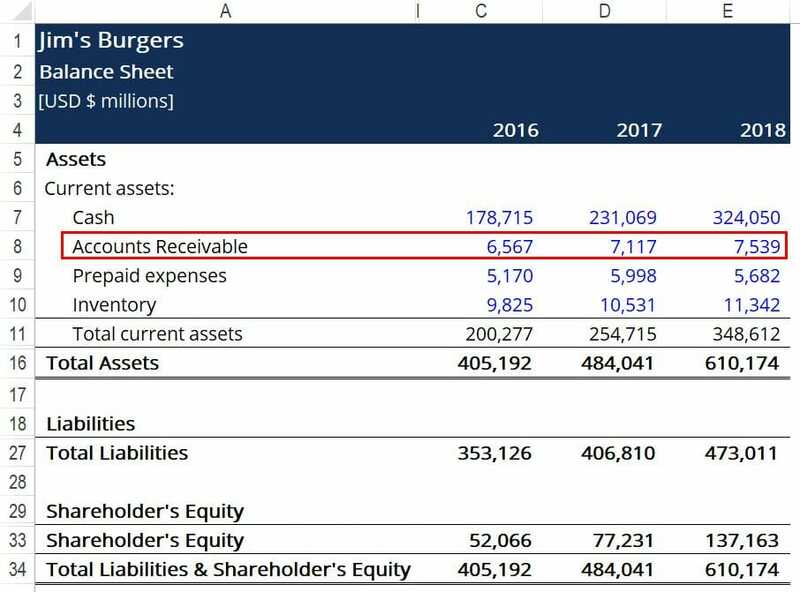 Found in the “current assets” section of the balance sheetBalance SheetThe balance sheet is one of the three fundamental financial statements. These statements are key to both financial modeling and accounting. The balance sheet displays the company’s total assets, and how these assets are financed, through either debt or equity. Assets = Liabilities + Equity. Sales – refers to all sales that the company has realized over the given accounting period, including sales on credit and cash sales. 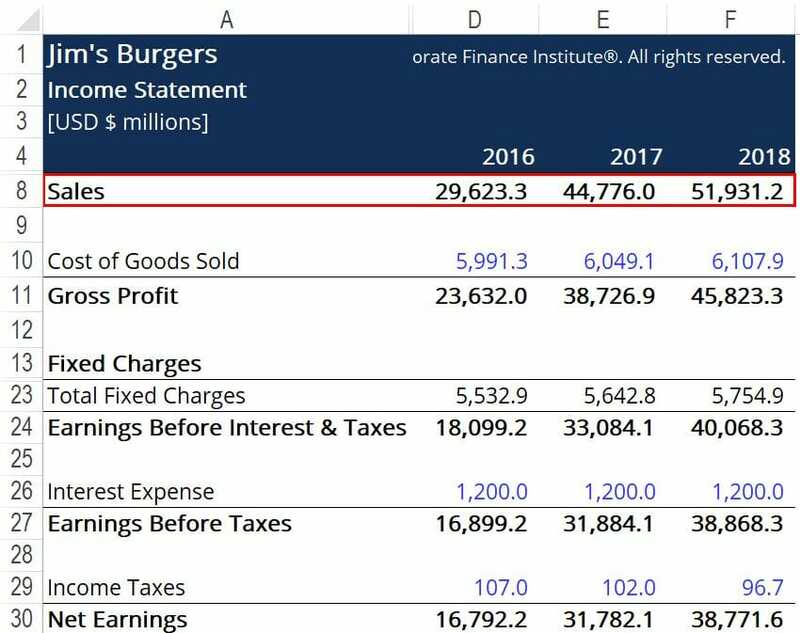 Found on the income statementIncome StatementThe Income Statement (or Statement of Profit and Loss) shows performance from operations of a business. The financial statement begins with revenues and. Generally speaking, a low Accounts Receivable to Sales ratio is almost always favorable, as it means that the company’s cash collection cycle does not represent a great liquidity risk. The bulk of the company’s sales go into its cash account, which can then be used to finance the business. A low AR to Sales ratio also means that the business is generating fairly large cash flows from its operations. It relies less on its investing and financing activities for liquidity. However, a company can see some benefit to having mostly credit sales in the form of accrued interest. Businesses can incentivize purchasers to pay within a certain time frame by treating accounts receivable as debt and charging interest beyond a certain time. In this case, we see that Jim’s AR to sales ratio is consistently decreasing year over year, which is indicative of improving liquidity for the business. This means that an increasing number of purchasers are buying from Jim’s with cash upfront, rather than on credit. This will likely lead to an increase in Jim’s operating cash flow, which may allow the company to consider debt financing in the future.